There is baking in this post, (it’s been far too long!) 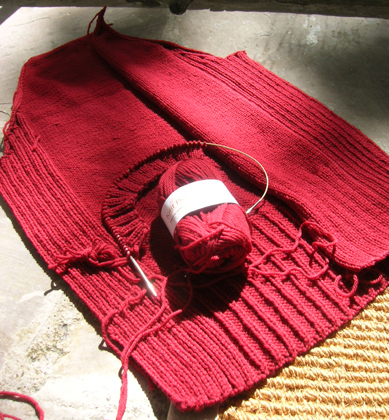 but since this does still remain a knitting blog, I’ll start off with the Ribby Cardi. I’m onto the 2nd front piece, fuelled by a sort of escape-velocity speed of knitting wherein I hope that if I knit fast enough I’ll still have enough red left for both the fronts and the buttonband. I think it’ll be okay. I think. But if I have to place a Knit Picks order and try to only order 1 ball of yarn? Shee-yeah, right, that’s likely to happen. Before I get to the baking, lemme tells ya about the food. The veggies this week have once again been met with my full force. The swiss chard subbed in for escarole in this skillet recipe, the butternut squash became this fantastically awesome pasta recipe which I’d forgotten about, the tomatoes got sliced up with some basil and vinaigrette, and some potatoes and carrots became this yummy soup. If I can stagger back to the kitchen this evening, more of the tomatoes will be turned into some pizza with olives. YUM. It’s a lot of cooking particularly on the weekend, these last few weeks, but it’s worth it to have leftovers for the rest of the week. There are sadly no pics of any of this – I don’t seem to have as much patience to stop and take pictures before devouring my dinner – but I’ll personally vouch for all of those recipes. MMM. I know this is horribly unseasonal – in the markets there are apples and pears and pumpkins for crying out loud! and I’m sitting here making chocolate mint cupcakes? – but hey, whatever. This prep will come in handy come the holiday season. For this adventure, I combined a sour cream chocolate cupcake recipe with a mint creme filling and a simple chocolate glaze. My sour cream chocolate cupcake recipe came from Cupcakes Year-Round, but this recipe is pretty close. I like the way it turned out, just smack dab between cake and brownie texture. For the mint creme filling, I started with 1 can sweetened condensed milk, added 1/2 teaspoon of peppermint extract (add more in very small increments to increase the flavour), and kept on mixing in more powdered sugar until it got to a nice spoonable consistency. 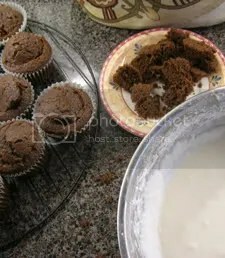 You fill the cupcakes by cutting a little cone shape out of each cupcake, slicing off the pointy end of the cone, spooning (or piping) in the filling in the little hole, and then putting the top back on. Now, it’s ready for glaze. 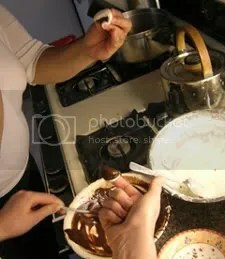 For the glaze, I warmed 1 cup of heavy cream to just-bubbling, and poured over 200g of chopped dark chocolate. 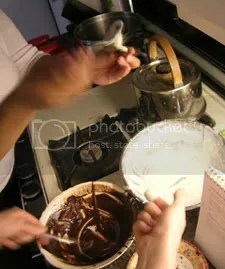 (Dark chocolate for that nice Junior-Minty flavour, mmm…) Let it stand for a few minutes and then stir it up until it’s a good drizzly consistency, but not so thick that it needs spreading. Drizzle it over the cupcake tops until smooth, then let stand. (it will harden up.) Garnish with some crushed up peppermint candies for easy identification purposes. Mmm. you certainly do out-do yourself in the cupcake sagas. mmmm. I should make another Ribby. My first one was made in a wool/acrylic blend and I don’t really like it that much. I love your ‘escape-velocity speed’ theory! I have everything that can… crossed for good luck! She’s looking beautiful…. I’m knitting a blankie square with the Swish and dude, it is SOFT. Those cupcakes….look SO good! and I’ve gotta say, your photography skills astound me. So yeah, about all the apples and pears and pumpkins… not to mention all the zuccini squash out there…..
You have so much fun! Seriously, I’ve been putting quite a bit of thought into that ‘flat you know who’….. one of these days. oooh – those cupcakes look amazing!!!!!!! I love filled cupcakes! go go go on that cardi! 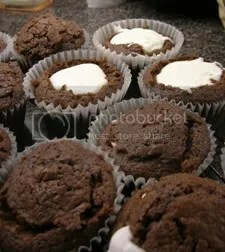 I LOVE your cupcake addiction- and I’m totally off in search of your chocolate sour cream recipe. I find sour cream just adds a certain richness to everything. Thanks for being so generous with sharing the links to those recipes. The bacon, squash and goat cheese linguine is going to be on my to-do list, for sure! Oh my. Those cupcakes look … sinful. 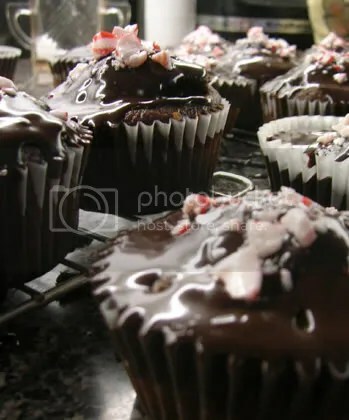 I love the combination of chocolate and peppermint.. So yummy! But don’t they dribble all over you when you eat them? 😛 I could see myself getting pretty messy, given a couple of them cupcakes! Dude, those cupcakes look sinfully delicious! Mmmmmmmmmm! Thank goodness no time to bake at the moment or I would have made (and scoffed) so many cupcakes all because of you!